The tuberose has white flowers and grass like leaves and stems. Several tuberoses are shown in the picture on the right in August. They were planted in May as bulbs on the east side of a six foot wall, so they receive direct sunshine until noon and shade in the afternoon. Tuberoses are easy to grow in Phoenix Arizona. They handle the summer heat well when given enough water, and go dormant in the winter so there is no need to worry about them freezing. The only way a tuberose could be damaged by the cold is for the ground to freeze down to the level of its dormant bulb which never happens in the lower desert. The fragrance these flowers produce is sweet, strong, and similar to that of a gardenia. During hotter weather, the flowers open more at night but can still be smelled during the day. 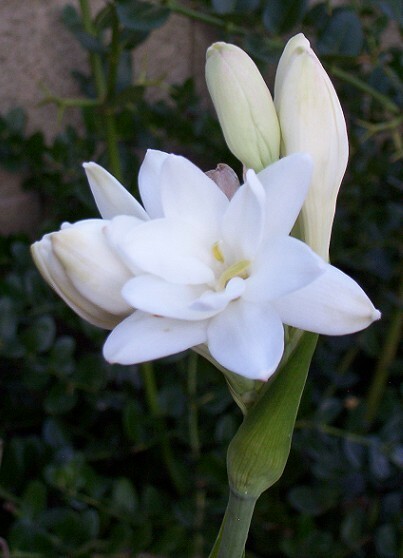 Tuberose is often used for leis in Hawaii being even more aromatic than plumerias. grows rapidly. The flowers don't take the dry heat quite as well as the plant and tend to dry up before opening during the hottest driest times of the year. During milder months, like in September, be prepared to smell their sweet fragrance wafting through your garden. The photo below shows a very unusual blooming of a tuberose in late January of 2009, which had been an unusually warm month with temperatures often reaching into the upper 70's F.
Tuberose is a bulb flower so it goes dormant in the winter and dies back. It will regrow from its roots when the weather warms up again. The only way the bulb can be damaged is if the ground freezes solid over 6 inches deep, which never happens in Phoenix. Dig a hole a little bit larger than the size of the bulb. Work in a 50/50 mix of compost to soil in the backfill, and bury the bulb several inches below its tip with the pointed end facing upward. It also is a good idea to finish with the hole an inch or two recessed so that a watering basin is formed. A basin irrigation method is preferable to ensure the plants get a good soaking every time they are watered. Tuberose do well on a grass watering schedule during the summer. Very little water is needed in winter when the plant is dormant. I occasionally fertilize with 5-1-1 and 0-10-10 fish emulsion. Chemical fertilizers might also work for tuberoses, but make sure to start with very small amounts to see if they get burned. Bulbs can be separated from the main root mass and planted elsewhere. 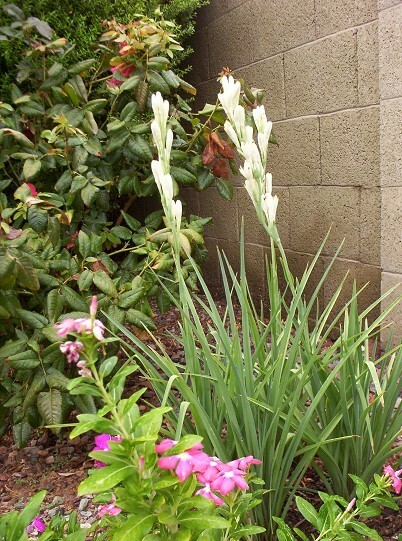 Tuberose has no significant pest problems in Arizona.